Want to try a pancake flavor you never heard of before? We have something for you. Do you ever feel like eating a classic fluffy pancake but at the same time you want to surprise your taste buds? 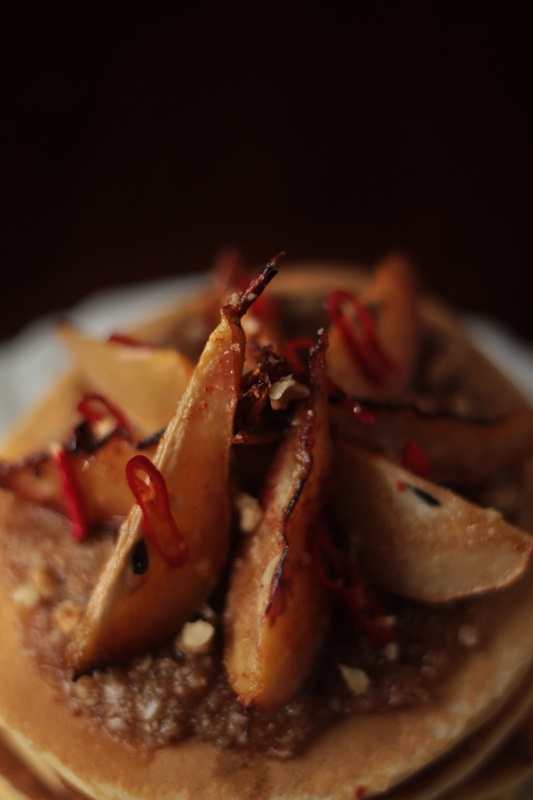 In times like this we like to use pears, homemade walnut pesto and as a little twist we top up the whole dish with a honey-chili sauce. Feel free to skip the chili part if you just want a sweet meal instead of a spicy one. Let's start with the creamy walnut-pesto one can quickly make with a blender. At this point let us emphasize that having a proper blender in your household is a great help for creating sauces, smoothies and well... pesto. Easiest way possible. If you don't have one just use your hand blender. Gather all the ingredients, add the oil and blend to desired consistency. Make sure you use sunflower oil and not olive oil. This is a sweet meal, you don't want the typical olive oil taste in here. We wrote "maybe more oil" because it depends on how you like your pesto. Always use liquids when you blend food. If you do it without adding a minimum of fluid you will find out whether you have a great blender with a lot of power - or you have a broken one. Put the pesto in a jar - keep it in the fridge if you have more than you need for the pancakes. Now we'll continue with the pears. We went for small ones so they can fit on top. 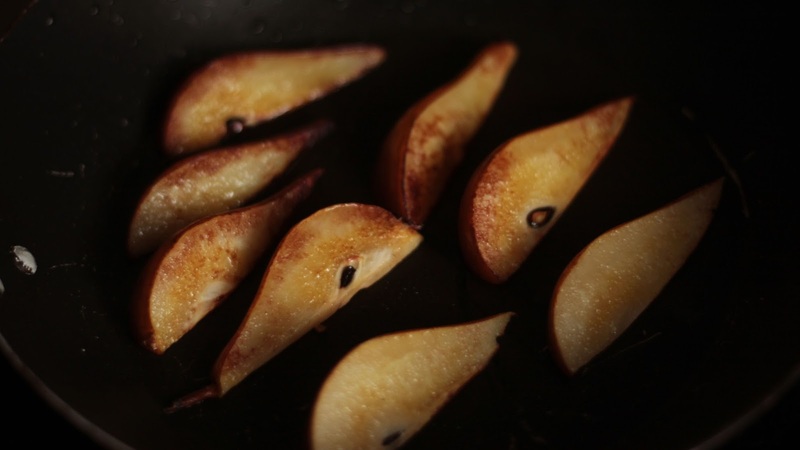 After slicing the pears into eighths they go into the pan with just a little bit of sunflower oil (about one tablespoon) for at least 2-3 minutes on each side. Let them get a nice brown kind of look like on the picture, but make sure not to burn them! The day before making these pancakes we chopped a couple of hot peppers and put them in honey. 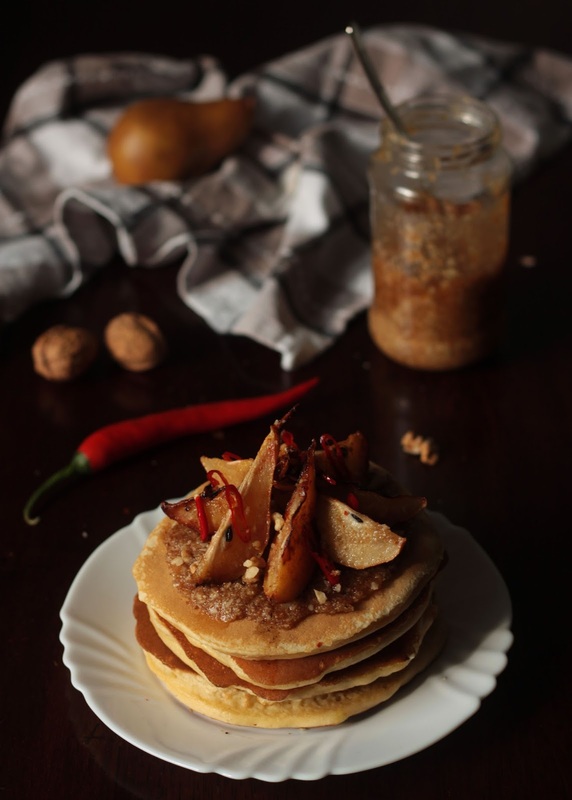 We wanted to achieve a sweet and spicy taste that suits the fried pears and the pancakes with the nut pesto at the same time. Disclaimer: if you want to make some chili-honey yourself, you will get the best results by using dry chills, they contain less water than fresh ones and the sauce will be good much longer. That wasn't a problem for us, because we only made a very small amount and used all of it. Since the toppings are well prepared, get that pancake-dough running! We used a neutral, slightly sweet dough with buttermilk for this recipe. The buttermilk reacts with the baking soda and the result will be thick and fluffy! If you don't have any buttermilk, you can also go with normal milk combined with 1-2 tablespoons of lemon juice. 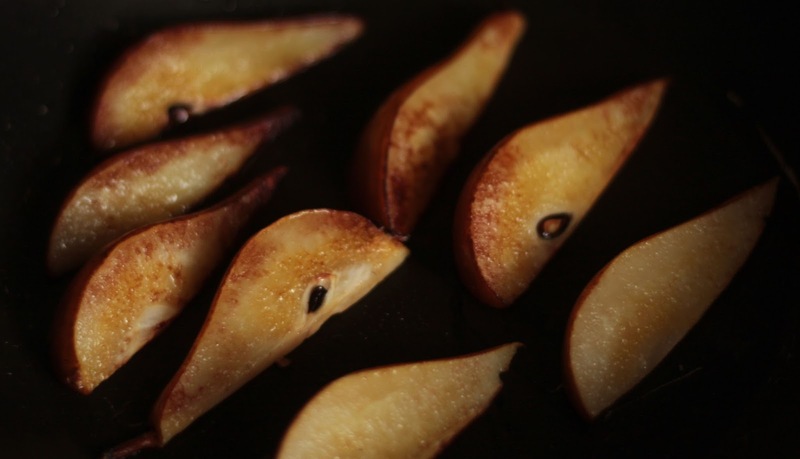 Fry the sliced pears in a pan with just a little bit of sunflower oil for at least 2-3 minutes on each side. Mix up all the dry pancake ingredients (except the 15g of sugar) and set aside. Separate the eggs into a big bowl for the egg white and a small bowl for the egg yolk. Melt the butter (put it in the microwave, have a look at it every 30seconds until it's liquid) and let it cool down before combining it with the egg yolk and 15g of sugar. Pour the buttermilk into the bowl with the egg whites and whisk it until it starts to thicken a little; you don't want the beaten egg white though. Give the egg-yolk-butter-combination to the egg whites and whisk to a creamy mixture. Got your flour? Your salt? Baking powder? Good. You better mix the dry ingredients beforehand, so you don't have to mix the whole dough for a larger time. Mix all the dough ingredients. Blend lightly until you have small lumps left. That's totally fine. Now put the dough in the freezer for a little nap. Heat up your pan, don't use any oil and let the flipping begin. 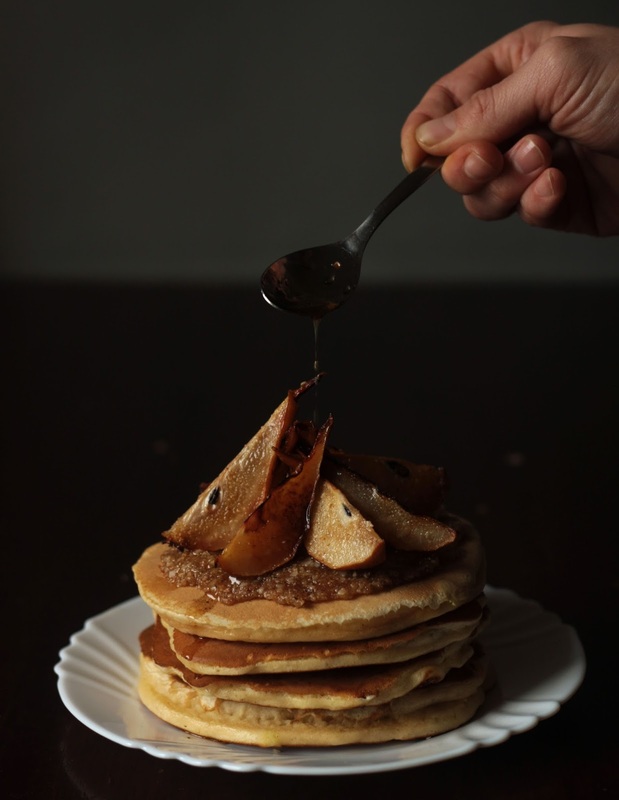 Build a nice stack of three or four pancakes, spread some pesto on them, put those sweet pears on top and finish the masterpiece with a glaze of chili-honey. Normal honey or maple syrup should do the job as well. Let us know if you tried the pancakes. If you want to know when we post new recipes follow us on Facebook and Instagram.